While Windows 10 makes it easy to hide/unhide files and folders, it does not provide any option to password protect files and folders. 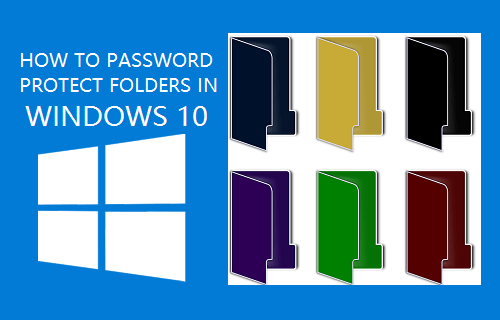 Hence, let us take a look at some of the third-party tools that can Password Protect Folders in Windows 10. The only native way of protecting Files and Folders in Windows 10 is to hide the File/Folder or you can Encrypt the File/Folder in case you have Professional Edition of Windows 10. However, hidden files can be easily un-hidden by anyone using your computer and this cannot be counted as a safe method of protecting files and folders. Also, the option to Encrypt files is not available in the Home Edition of Windows 10. Hence, currently the only reliable way of protecting Folders in Windows 10 is to make use of third party software programs. In case you have a professional edition of Windows 10, you can encrypt a file or folder by following the steps below. 1. Right-click on the File/Folder and then click on Properties in the contextual menu. 2. On the Properties screen, make sure you are on the General tab and click on the Advanced button. 3. Next, check the option for Encrypt contents to secure data. 4. Click on Apply and OK. Note: As mentioned above, “Encrypt contents to secure data” option may not be present, grayed out or not selectable in Home Edition of Windows 10. For Home Edition users, the only way to password protect folders in Windows 10 is to make use of various third-party tools that are available. Since, there are multiple programs that can password protect folders, we are providing below some of the better known third party software programs. Protected Folder can protect multiple Files and Folders on your Windows 10 computer and it uses one master password for all of them. It has an easy to use interface and makes it really easy to add folders that you want to protect. You can either click on the Add button or just drag and drop folders into the program. Protected Folder is free to use for up to 20 times, then you have need to pay $19.95 per year in order to keep using it. Folder Lock Lite allows you to protect Files, Folders and also protect entire drives. The program is easy to use and allows you to add as many Files, Folders and drives as you want to protect by just clicking a button or dragging and dropping folders. Folder Lock Lite is free to use for up to 30 days, after which you will be required to make a onetime payment of $24.95 in order to use the application. Folder Guard has better features as it allows you to setup individual passwords for individual folders, instead of one master password. You can also assign specific access permissions for different user accounts on your computer. Folder Guard is free to use during its 30-day trial period, after which you will be required to pay $39.95. The paid application can be installed on two computers, which makes it cost effective. Folder Protector is free to use but you will be required to pay a onetime fee of $24.95, in case you want to make use of its 256-bit encryption capability. Using this tool is easy, just pick a Folder and set a Password, the program will then encrypt the folder and make an EXE to unlock the folder (with the password).